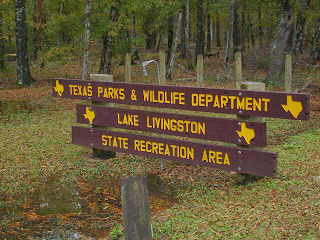 After almost one year on the road with Lady Blue, it is time to return to our official home base at Livingston, Texas. This is home base of our group called Escapees. 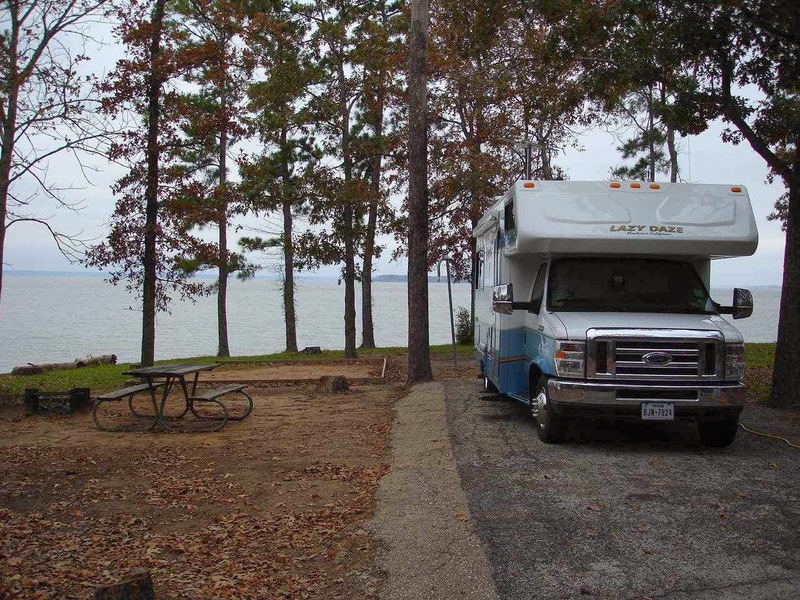 This camping group offers a number of services for full and part time RVers. 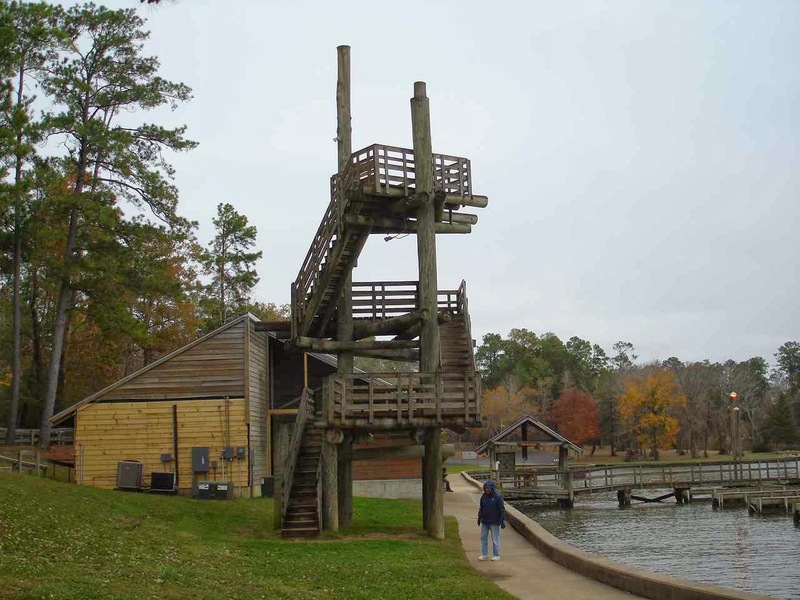 We have used their resources for many things including our mail forwarding, Escapee campgrounds around the US, and good Rving information from longtime campers. 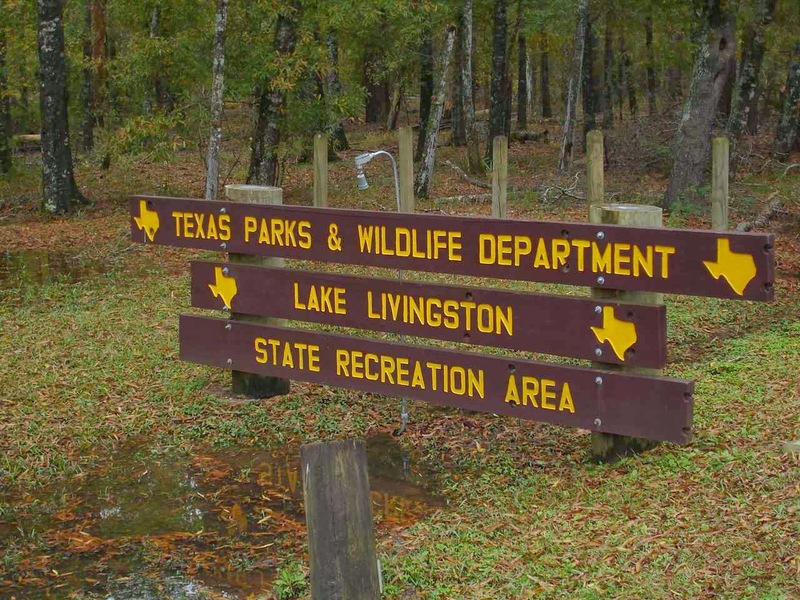 Among other things, we need to check in with our dentist, update our vehicle registration and inspection, and use an exclusive Escapee offering in Livingston--and now at some of their other parks--called Smart Weigh. Smart Weigh is an RV weighing station where you can have your vehicle weighed at each end of each axle. The weights can then be compared with your limits for each axle and you can also see if you are unbalanced on certain wheels. We are pleased to find that our Lazy Daze is well within limits on each axle and that we are well balanced on all sides. As a matter of fact, we are under by about 1900 pounds. Our weight was 12,150 pounds for our gross vehicle allowed weight of 14,050 pounds. The officials at the scales indicated that most RVs that you will see on the highway are overweight, carrying either more weight than is allowed for the entire unit , or , more often, overweight on one or more tires almost guaranteeing a tire failure somewhere. 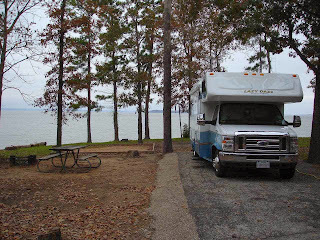 The good news is that although the motor home right in front of us was over by about 1800 pounds--scary--Lazy Daze motorhomes are well built for balanced loads in general and we were definitely what are call "minimalists" in what we try to carry with us. Well, we are not completely caught up with things. Both Jan and I are in need of dental work. Luckily, we have a good dentist here in Livingston. So, we will move around this part of Texas for a while until we catch up. 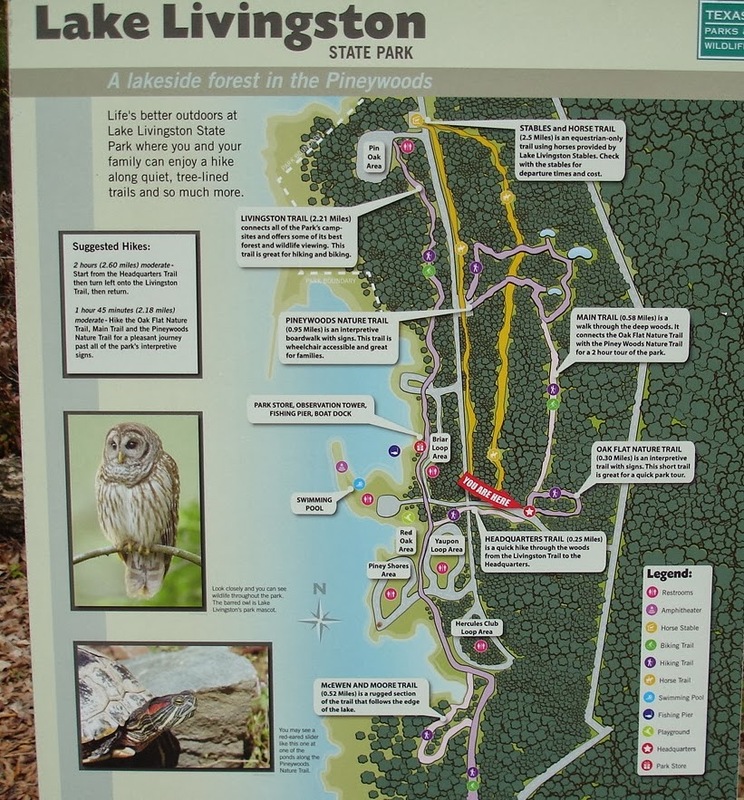 Our new stop is at Lake Livingston State Park. 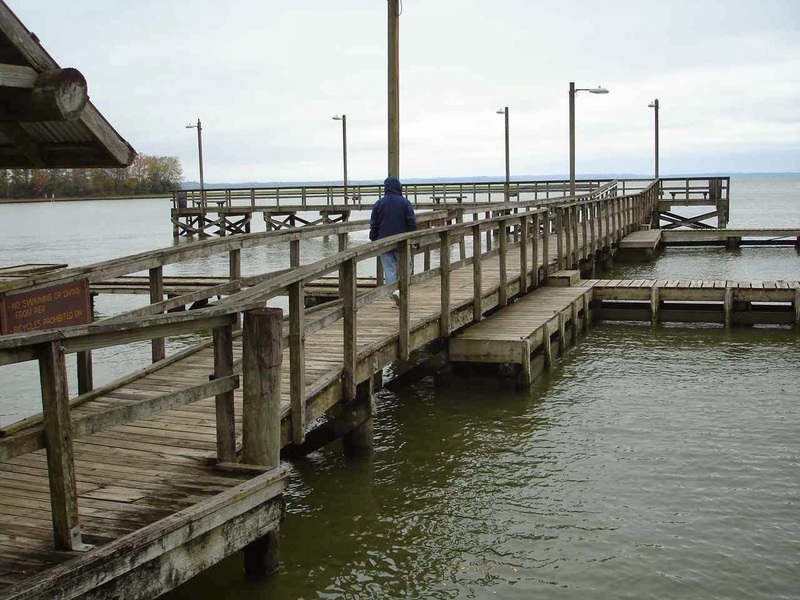 This is a large lake with good level sites and plenty of acreage for walks. Just past a large rainstorm from last week, we are now looking at a new storm. Not many folks in camp this weekend. The high temperature today in 37 degrees. Yet, we have a few campsites of families and fishermen camping in tents!!! Still better than the snow and ice up Dallas way. We are the wimps who are quite happy in our cozy :Lady Blue with our own great view of the lake. 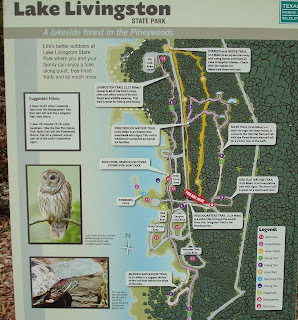 We do, however, go for some nice long hikes. Down by the waterfront is this huge viewing platform close to the campground store. Very quiet at the park today. We did not see a single boat in the water. 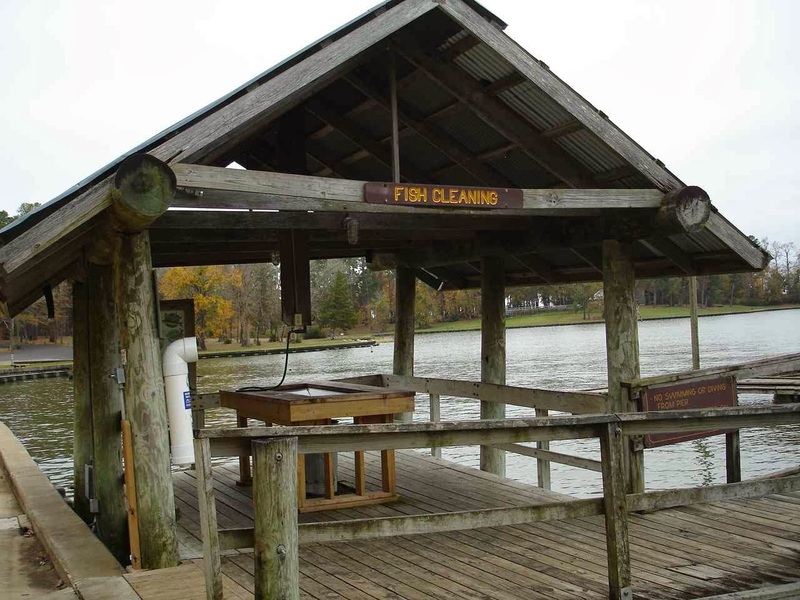 We would say that this fish cleaning station is a step up from the basic one at Martin Dies last week. A well lighted dock at the waterfront with a number of fixtures for tying up your boat. Also , a well used but functional gas pump at the dock. That would be for use in the summer. We had stopped by this park not long after Hurricane Ike and a year or so of the drought. Lots and lots of downed trees making the park somewhat undesirable for pleasant camping. 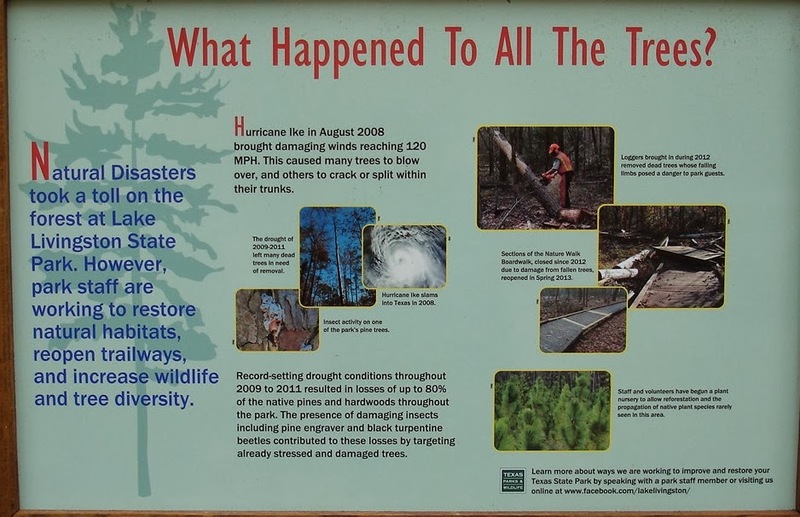 While there are still sign of many downed trees, the park is greatly improved this year. 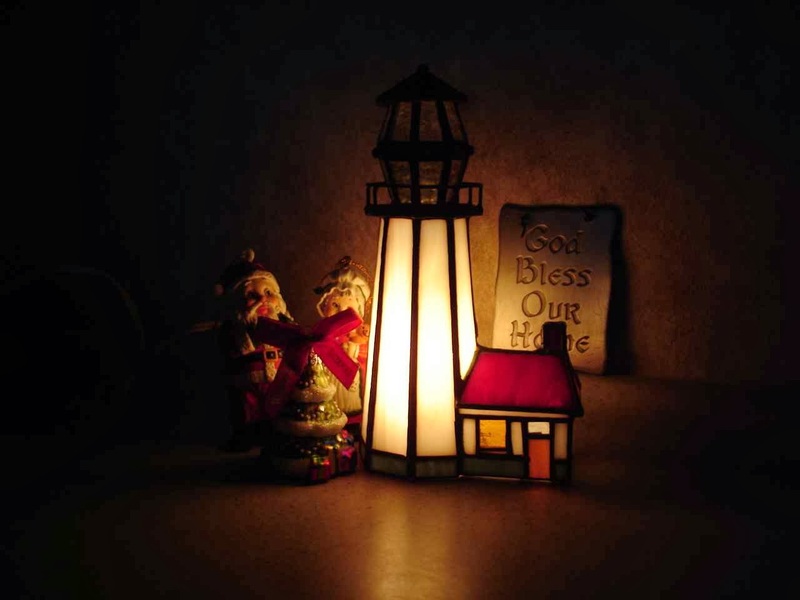 The most difficult times of fulltiming are probably the holidays. We always miss family and friends. 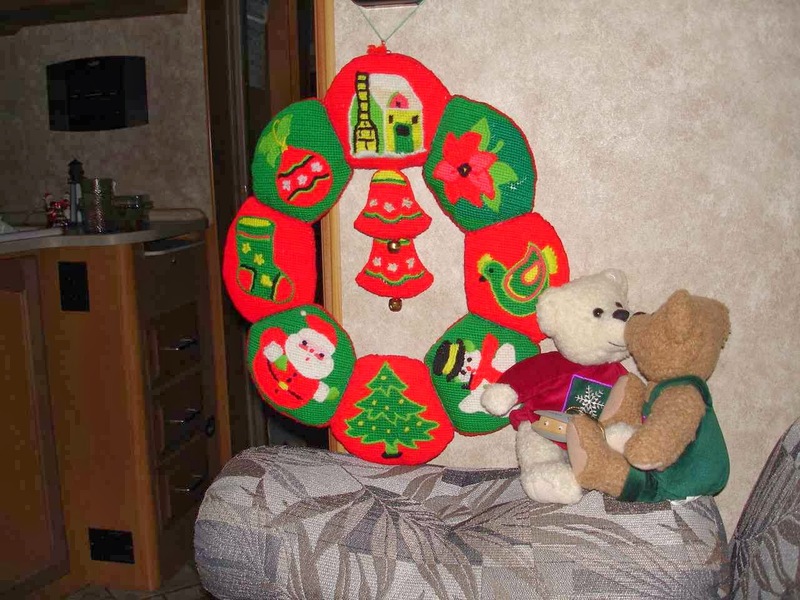 In a small 24 foot motorhome, there is not much room to carry Christmas, but we make do with a few ornaments and decorations from our house. The lighthouse works year round . Remember the Christmas tree, Alison? Grammy's handmade wreath fits nicely over the couch. The kissing bears are a reminder from the old house. 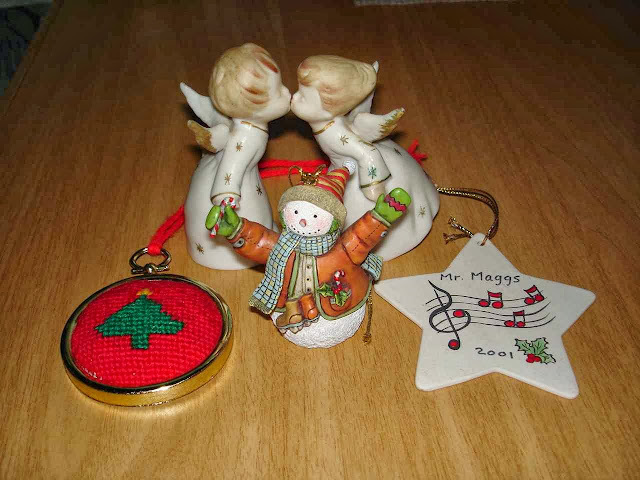 The kissing angels were a gift from Grammy for our first Christmas 45 years ago. She also made the Christmas ornament. The other ornament was from some wonderful students 12 years ago. Do you remember, Stacy? 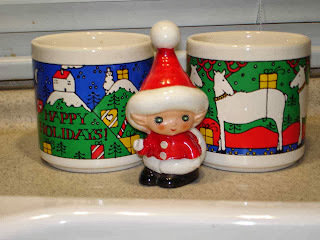 We even do a little celebrating with some Christmas mugs. 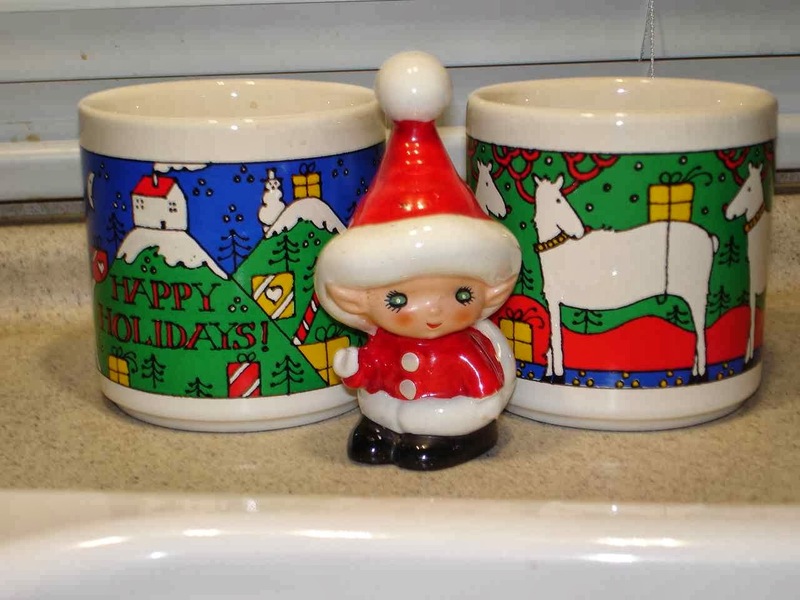 The mugs are from good friends Peter and Jeannie many years ago. The Santa elf was from Bruce's grandmother back in the 1970's. Well, we may have to stay in this area for a while. But, this is not bad for a back yard.